Ever wanted to go sailing? Sign up for Adventure ! 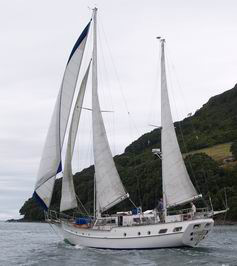 Come cruising to or from Great Barrier Island on a 12 to 15 hour trip for only $220pp (all meals included). Come on a day trip from Tryphena to Port Fitzroy for $150pp (lunch included), or arrange your own personalised charter. The Enterprise III is a luxurious traditional 65 foot timber ketch with all the mod cons and sailed by an experienced crew. Phone Chris on 027 449 2429 or 021 070 0427 or contact us for more info. © 2019 Stray Possum Lodge. All Rights Reserved.